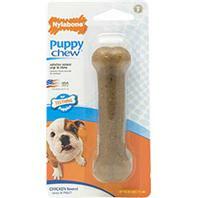 • Teething Bone Will Help Ease A Puppy S Sore Gums, While Working The Teeth Through. • Not For Use With Strong Chewers Or Puppies Who Have Any Adult Teeth. • Bristles Raised During Chewing Will Help Clean Teeth and Reduce Plaque and Tartar Buildup. Inert soft thermoplastic polymer. Not consumable. Small shavings no larger than a grain of rice will be passed through harmlessly. Replace when the knuckles have been worn off. Size: regular. Nylabone - Puppy Bone - Regular product is categorised under Wholesale Nylabone Products, PA products, Wholesale Dog Products, Wholesale Toys, Wholesale Chew Toys.